I have a cousin who's currently serving our country in Afghanistan. She's one of the strongest women I know (for more reasons than I'm willing or able to list here), and I not only appreciate her service to this country, but admire her. She's been through so much, and yet she keeps going, encouraging, supporting. Today's post is in honor of all veterans, but it's especially dedicated to her. It's almost time for her to come home, and I can't wait. It may have seemed like a long week for many of us, but try comparing that to life in a war zone, across the world from the people you love most. You have to be mentally tough and emotionally... well I don't even know the word to describe what you'd need in that department. You learn to live without certain luxuries (my cousin's really looking forward to getting her hair done), and your life is in constant jeopardy. Still, my cousin is compassionate and fun-loving. When she's stateside, she's stylish and feminine... but also tough. 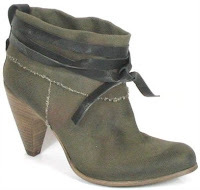 This Invince Able bootie by Bronx (available via csnstores.com), with its ruggedly feminine appearance reminds me of her. The 3.5 inch heel is lower than what she'd wear for a night out, but it's comfortable, like her company. The distressed canvas, like her heart, has been through quite a bit, but that treatment is what makes it unique. Tonight at happy hour, be sure to toast the past and present veterans who have put their lives on the line (and sometimes lost them) in service to our country. Drink a Chocolate Soldier (recipe & image via absolutdrinks.com) in their honor. It combines Remy Martin Cognac, dry vermouth, dark cacao liqueur and orange bitters for a cocktail that's slightly sweet, plenty strong and full of characters (just how I like a man in uniform). Be careful not to drink too many of these, though. Seriously, one girl can only take on but so many soldiers- even when there's chocolate involved. cute shoe, beautiful thoughts, wonderful read!